I found this recipe in Family Circle magazine and adapted it, because that is the way I roll. I thought it was a really cure way to use that mini-bundt pan I rarely break out. 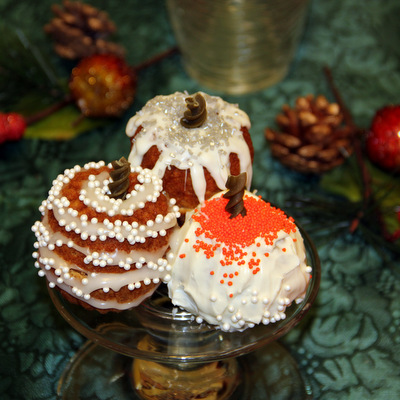 There are several ways to decorate these pumpkins. 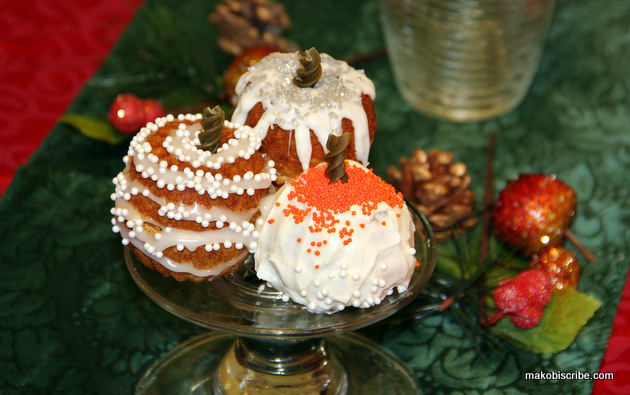 You can frost like normal, or create a swirl pattern and sugar, or just frost and sugar the tops. The possibilities are endless and these are just so cute, you can create them over and over. They are sure to be a huge hit at your holiday gathering. I often substitute coconut oil for oil and butter when I am baking because I believe it is a healthier option. There are many different types of coconut oil, but I prefer the Gold Label Virgin Coconut oil because of the light taste. As you go through my recipes you will see I use it often. One of my favorite things to do near the holiday season is to create handmade gifts like my Cake Ball Truffles Recipe which I also use coconut oil in. So do you want to win 1 quart of Gold Label Virgin Coconut Oil? Enter the Giveaway Tools form below. You can also watch the video they produced about Gold Label Virgin Coconut Oil featured below. Tropical Traditions provided me with a free sample of this product to review, and I was under no obligation to review it if I so chose. Nor was I under any obligation to write a positive review or sponsor a product giveaway in return for the free product. Oh those looks sooo yummy!!! Thanks for sharing! These are just the cutest and I love how you decorated each a little differently. I would have never thought to use coconut oil in a recipe like this. Those are adorable and looks easy enough to make! I can’t wait to try them! You had me at “pumpkin”! Those are so cute! I bet they would be tasty with cream cheese frosting. Bookmarking for this fall. Looks sooo yummy!!! I love pumpkin everything! I also like to use coconut oil in my baking. Thanks for sharing! Saving for next month! These look like awesome cakes for the fall! Yummy! I love these pumpkins! I have a mini bundt pan and was using it for jello molds, but this is an even cooler use for it. Those are super cute! I bet they’re quite tasty too! I can eat pumpkin all year long!! YUM!! I’m stopping by to welcome you to the Biannual Blogathon Bash ( ) in January. You recently signed up and I just wanted to say hello and thanks for joining us. We’re looking forward to seeing you there!